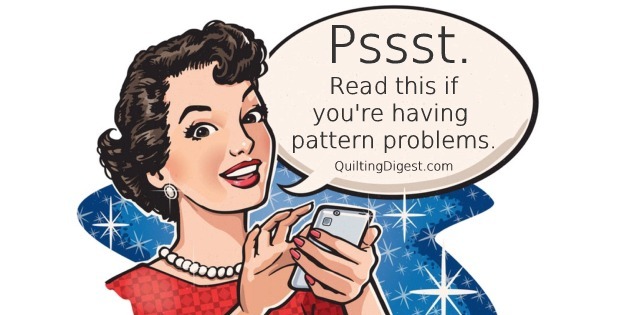 Are you having problems downloading a pattern you purchased through Quilting Digest? Is there another issue you need help with? Read through the rest of this page. Chances are there’s information here that will help you. Why Can’t You Download That Pattern? What if a Pattern Won’t Print? 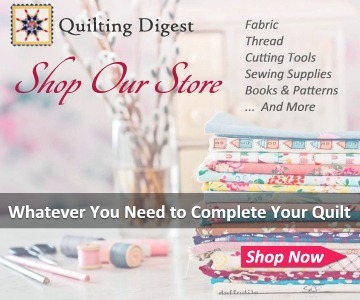 Quilting Digest frequently publishes articles with links to patterns. While we include as many free patterns as we can, we often showcase patterns that are for sale, as well. The reason for that is three-fold. First, while there are many good free quilt patterns and tutorials to be found online, we’ll often find a pattern for a great looking project only to discover that the pattern is hard to understand or is even incomplete. We want to provide you with good patterns that won’t give you problems, so sadly, we often need to pass up free patterns. Often, projects that are free are not as well-designed as comparable patterns that are for sale. As with anything, getting something of quality usually means having to pay for it. If given the choice between a poorly designed project with a free pattern and a well-designed project that costs, we’ll go with the pattern that’s for sale every time. 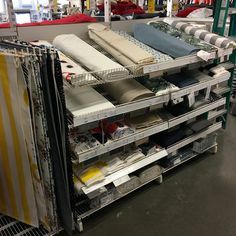 We do skip over patterns that seem to be unreasonably high priced. Just like you, we need to watch our budget and are careful not to recommend the priciest patterns – unless, on occasion, they’re for something we think is truly special. Finally, while Quilting Digest comes from our hearts, we do need to cover the cost of our time and expenses. We have to make ends meet every month, just like you do. If you haven’t guessed already, we spend a lot of time every week scouring the internet for quilt projects we think you’ll enjoy. One of the ways we cover our costs for doing that is by showcasing some patterns that pay us a small commission when purchased (in some cases a whopping 80 cents per sale!). Not all of the patterns that are for sale pay us a commission. Our goal is to provide you with great projects, and if we find something we think you’ll love, we’ll post it whether or not we’ll get a commission. There have been some issues with the ads on the site. Sometimes, visitors click on an ad while trying to access the showcased pattern, and get tangled up in a maze of … whatever. From what we’ve heard it sounds pretty grueling. We don’t like the ads either, but – and this is a big but – every time one of you clicks one of those generic, “free whatever” ads we make some money. It doesn’t cost you anything except a moment to discover you’re in the wrong place and to close the page (unless the ad is so misleading you continue to think you’ll acquire the pattern by going through all their hoops – we really hate that!). We truly wish we could omit those ads entirely. But, until we develop other ways to monetize the site, they have to stay. The ads bring in way more income every month than commissions from patterns and other products do, and you don’t need to buy anything to make that happen. So, we’re all stuck with them for the time being. The best we can do for now is to point out the ads that might give you trouble. Ads that are branded to companies you know, like Amazon, Craftsy, See’s Chocolate, Ebay, etc. simply take you to that website if you click on them (we typically don’t earn from those ads unless you buy something). Just skip those over and look at the text of the article. We’re doing our best to make the pattern links stand out from the article text (currently they’re in yellow boxes) so you don’t get tangled up in those other misleading ads. So, why are we telling you this? Won’t telling people NOT to click the ads cause us to lose money? Yes, it probably will. But, it’s so frustrating to hear about people who can’t find the patterns, or worse yet, who end up in some strange drawn out signup process that is never going to give them what they want. Instead, we’d rather just tell you where to click. Enough people will click those ads by mistake, anyway, that we’ll still earn what we need from them (we hope – fingers crossed!). First, are you sure you clicked the correct link to the pattern, and not an ad? Pattern links on Quilting Digest are nearly always text links – a bit of text in the article that you can click on – that clearly say something like “Click here for the ‘name of the project’ pattern” or “Get the ‘name of the project’ pattern here”. In some cases the link for a free pattern will take you directly to a PDF you can download. 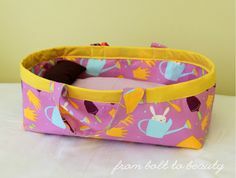 In other cases the link for a free pattern or tutorial will go to an indie designer who is offering the instructions for free on their website. In most cases, for free patterns and tutorials, you will not be asked to enter your contact info, or to sign up for or subscribe to something. However, the bigger sites that offer free patterns often do require that you give them your email address in exchange for the pattern (Craftsy comes to mind). That should be a very simple process that only takes a minute. Quilting Digest does not sell patterns so every pattern link will take you to another site that does, or that provides free tutorials and/or patterns. Quilting Digest will always say in the article if the pattern is free. Patterns that you purchase are handled entirely by the site that sells the pattern. 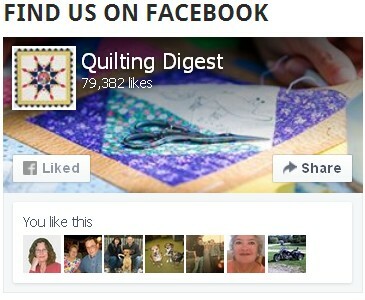 Quilting Digest is not involved in any way, other than showing you a great pattern that’s available. Consequently, we can’t help if you’re unable to download a pattern after you purchase it. Be sure that the pattern you’re purchasing will be available for download. In some cases it could be a printed pattern that will be shipped to you. In most cases, once you’re completed your payment you will be taken to a page to download the pattern from. So, don’t close the window until you reach the download page – or, reach a page that says to check your email for the download link. Nearly every company that offers downloads will send a follow-up email with a link to the download. That may be part of the receipt. Or, it may be a second email with just info about how to download your pattern. Click here for instructions on how to find and download patterns you purchased from Craftsy. If all else fails and you still can’t download the pattern, you’ll need to contact the company that sold it to you and ask for help. Often a phone number and/or email address will be provided on a Contact Us page. Humorous images, spectacular quilts, art quilts and other things of interest to quilters that usually do not have patterns available. 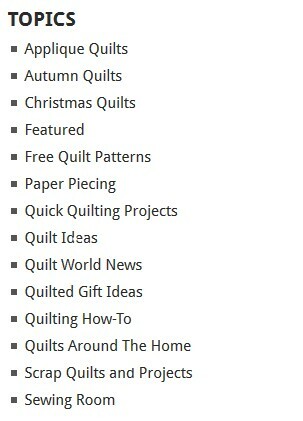 Articles from the Quilting Digest website. All of our articles that feature quilts or other projects do have instructions and/or patterns available. Enter a few words of text that describe the pattern you’re looking for into the search box and press your Enter or Return key. Hopefully, the pattern you’re looking for will appear in the search results. Make your best guess about which category the article might have been stored in, click on it, and look through the articles under that topic. Hopefully, one of these suggestions will help you to quickly find the article and pattern you’re looking for. No, actually, we can’t. We don’t have access to any of the patterns, since they’re all provided by someone other than Quilting Digest. If a PDF pattern won’t print, that’s between you, your computer and your printer. Believe me, we know how frustrating that can be, as it happens to us too. You’ll need to find someone techy to help you. There’s just too much involved in troubleshooting printer issues for us to address here. In the meantime, perhaps you could attach the PDF to an email and send it to a friend to print for you. Or, attach it to an email and save it as a draft. Next time you’re near a print shop ask them to print it from the draft accessed via your phone. Just be sure to carefully follow the printing instructions. Patterns with templates will need to be printed at actual size and with no scaling so the templates are the right size. Also, make sure they’re set to print on just one side of the paper. Here are a couple of Craftsy articles that might help you print patterns to the correct size. How to find and print your purchased pattern. 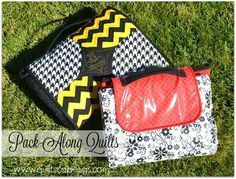 How to print sewing patterns (useful info there for quilt patterns too). Please let us know in the comments below if you think of something we haven’t covered. If you just can’t solve an issue and need help from Quilting Digest (rather than the pattern supplier), you can reach us using information on our Contact Us page. Thank you for this info. So needed. Looking forward to what you have to offer! Amy, thank you for letting us know there was a problem. It has been fixed now. Looking for the table topper made with a 60 degree angle… Help pls…thx,. I just adore all the patterns that pops up on Facebook. Looking for Merry Santa Plcemat pattern through Annie’s, but it is not available there. (Santa’s white moustache holds napkin and silverware.) Help?!? I saw a ad on pop up for a fat quarter that was folded and had one button. It could hang and hold things. It said it was in Quilt Digest August I have not been able to find any where that sells it in two states now. Is there a way U could get an old addition? Thank you.